As noted in our most recent e-mail to the MANA community, one of a series of meetings is being hosted at Medlock Elementary to discuss T-Mobile's desire to erect new cell phone towers in our area. The following two articles discuss a similar situation, still ongoing, in East Atlanta. The Patch has an item discussing cell tower plans for our area (May 4, 2011): T-Moblie Proposes Tower at Lakeside High. 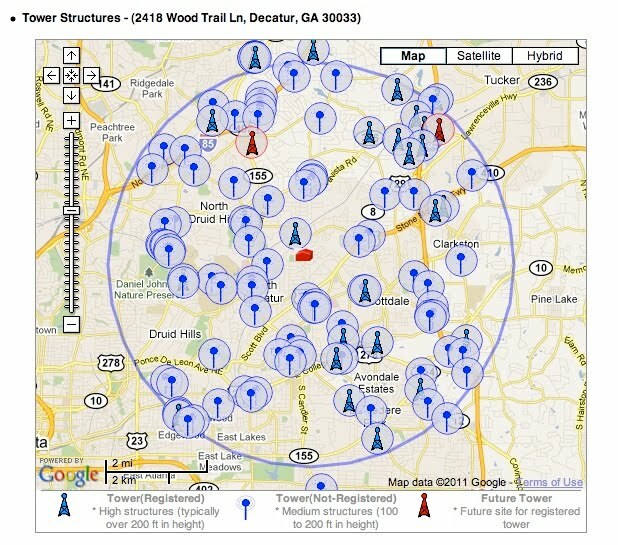 A search for Medlock Elementary's street adderss via the antennasearch.com website (which lists "towers and antennas used for cellular, microwave, paging, and other commercial purposes") shows existing cell towers, antennas, and applied-for permits for structures ~ 4 miles around Medlock Elementary. The lists and map available through the above link are clickable and you can explore additional information about each installation (location, owner). Per antennasearch.com, in the screenshot below, Medlock Elementary is at the center of the image. The closest registered tower (blue) is at 3391 NORTH DRUID HILLS ROAD; two future towers (red) are proposed for 3145 BRIARCLIFF RD (T-Mobile) and WEST EXCHANGE PLACE LaVista (Dekalb Co. Police). In reference to The Patch article linked earlier in this post, Lakeside High's street address is 3801 BRIARCLIFF RD. NE; this is approx. 1.5 miles away from the proposed tower at 3145 Briarcliff Rd.